The stand-out keyboard of 2019? NAMM 2019: Korg has injected a little more sass into its Kross workstation with the announcement of a Special Edition. Available in four neon colour options, this also contains additional PCM that facilitates ‘special’ acoustic and electric pianos, as well as fresh synth and drum sounds that are designed for EDM producers. You can choose from green, orange, red and blue colour options, all of which scream ‘look at me’. As such, if you’re going to play one of these on stage, you’d better make sure you bring your A game. The Korg SE will be landing in March. 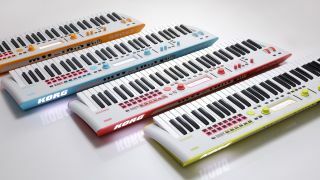 You can find out more on the Korg website, though we’re still waiting on price details.